When the Spaniards came to the New World in the 1500's, they brought along cattle -- live cattle. A live cow would remain in eating condition a lot longer than one cut up into portions and stowed in the hold of a slow ship. Naturally, over the years a few of the cows and a bull or two escaped from captivity and adapted to the conditions of the South Texas brush country. Eventually they became the famous Longhorns. They were mean, lean and could live off discarded cardboard boxes. Long before the Civil War, residents of Texas were making cattle drives into Louisiana, especially New Orleans. This was much against the law, but a man has to feed his family. After the Civil War, the folks up north developed a preference for beef over the pigs they had been eating since they came here. The Texans, quick to realize that a few bucks could be made, started thinking about getting cows up north. There were no railroads or interstate highways, so the best way to get a cow to the railhead in Abilene, Kansas was to let her walk. Thus began the storied cattle drives. The trail drive cowboys were just as tough as the cows they prodded along, but even a tough cowboy has to eat once in a while. The first trail drives were pretty basic affairs. Each cowboy was in charge of bringing his own breakfast, dinner and supper. The menu wasn't fancy; most of the cowboys brought some salt, some coffee and a sack of either pone or hard biscuits. If some wild game was found along the way, it did not go to waste. When the demand for beef on the hoof grew much larger, the ranchers soon found they could attract a lot better class of cowboy if they fed them a decent fare. It was impractical for each rider to carry his own supplies, so a wagon was employed. The first wagons on the trail were just wagons that hauled the food and provided a place to haul the cowboys' bedding and associated tack. Who Invented the Chuck Wagon? Charles Goodnight, one of the leaders of the trail drive era is given credit for designing the chuck wagon in its present form. Mr. Goodnight added heavy-duty running gear to the wagon and built a cook's cabinet on the rear. The cabinet had many compartments for holding various things needed for cooking, as well as a fold-down door that served as the cook's work table. 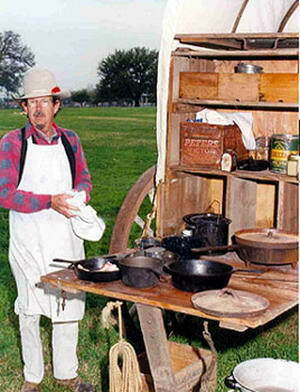 The chuck wagon cook was second in command on the trail drive. In his domain, which was the wagon and a 60-foot radius around it, he was the boss, and no one crossed him. It was said that if a chuck wagon cook was not fractious, he just had not been cooking long enough. The cooks also served as doctors, gravediggers (if their doctoring didn't take) and equipment repairmen. This could include anything from shoeing a horse to sewing up a cowboy's ripped jeans. It was not a specialized job. The cook was so important to the success of the trail drive that he was paid more than the regular cowboy, and the boss would tolerate behavior that would have sent an ordinary hand packing. When the cowboys were well fed and comfortable, they worked a lot better than they did if their needs were not satisfied. The most important thing that came from the chuck wagon and the cook was coffee. The cowboys could manage most any situation if there was enough strong, black coffee. The cowboys could manage most any situation if there was enough strong, black coffee. The first trail coffee came as green coffee beans that had to be roasted before they could be ground and made into coffee. In 1865 , John and Charles Arbuckle, who were grocers in Pittsburgh, patented a process for roasting coffee beans and treating the roasted beans with a mix of egg white and sugar to preserve freshness. The coffee made from these pre-roasted beans was an immediate success and is still available today. The usual coffee formula on the trail was one handful of ground coffee per cup of water. It was often called "six shooter coffee", as it was strong enough to float a six shooter. Next on the list of trail essentials was a constant supply of sourdough biscuits. The cowboys preferred biscuits to bread in loaves. The cook guarded his sourdough crock zealously. It contained yeast -- a living thing that required warmth and feeding. On cold nights, the cook would sleep with his sourdough crock to keep it warm. Beans made up a large portion of the cowboy's diet. Usually they were pinto beans, and occasionally a red bean would slip in. The beans were originally known as frijoles. Soon frijoles came to mean any beans. Beans were a favorite with all as they were cheap, easy to transport, they kept well in the dried state and were filling. The cook added a bit of salt pork to make them flavorful. Bean cooking has not changed over the years. The night before cooking, the beans are picked through to remove any rocks or other debris. They soak overnight and then go on slow fire until they are tender. This usually took three to four hours. They could be and would be served morning, noon or night. The subject of the type and amount of meat in the cowboy's diet is open for discussion. The whole operation was centered around a couple of thousand prime beeves on the hoof. I doubt there were fresh steaks every day, but when it did occur, the killing would take place in the evening so the meat could cool in the night air. The next morning, the supply of beef would be wrapped in insulating material such as the cowboys' bedrolls to keep it cool. The next evening, it would be unwrapped and cooled again. The meat still didn't keep very well. As it began to age, it was used in stew or chili. The better chuck wagon cooks would prepare treats for their cowboys as often as required. Sometimes the treats were just to build good relations between the wagon cook and the wranglers, and sometimes to reward a particular wrangler or wranglers for a good deed. We are about out of space for this month. Tune in next month for Part Two of "Cooking for Cowboys" when we will have more cattle drive lore and maybe some authentic recipes from the Old West.